Aircraft CTE-70 Tone Pulse Encoder. 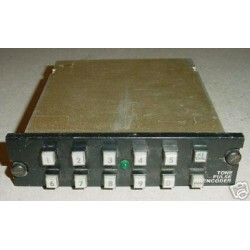 Aircraft CTE-70 Tone Pulse Encoder. Very clean item. It shows very well and it would make an excellent show piece for the bookshelf in the office or home or just as a mock up panel item. Do you happen to know the type of aircraft this item went on?? 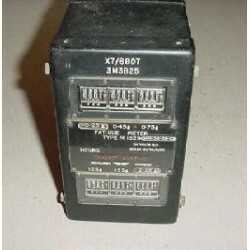 If so, PLEASE email us wi..
Fuel Consumed / Totalizer Indicator. Manufactured by Foxboro. P/N AT-204-17. It registers in lbs. It was removed from a salvage aircraft. Very clean item. It shows very well and it would make an excellent show piece for the bookshelf in the office or home or just as a mock up panel item. Fuel Consumed / Totalizer Indicator. Manufactured by Foxboro. P/N AT-204-17. It registers in lbs. It was removed from a salvage aircraft. Very clean item. 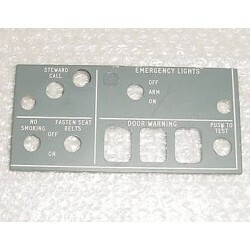 It shows very well and it would make an excellent show piece for the bookshelf in the office or home or just as a mock up pan..
British Aircraft Corporation BAC 1-11 / BAC One-Eleven Cockpit Control Panel Face Plate. P/N 01-33-1087. Very clean item. It shows very well and it would make an excellent show piece for the bookshelf in the office or home or just as a mock up panel item. Vintage Airliner Aircraft Cockpit Audio Jack Panel. Manufactured by Gables Engineering . P/N G-1531-EA. It shows very well and it would make an excellent show piece for the bookshelf in the office or home or just as a mock up panel item. 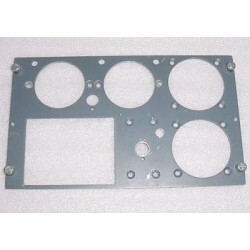 McDonnell Douglas DC series Instrument Panel Overlay / Insert. P/N unknown. It measures 9" by 5 3/8". It was removed from a salvage aircraft. RARE!! 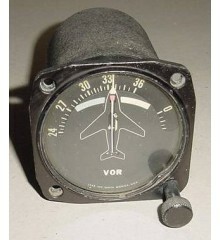 Vintage Airliner Fatigue Meter Indicator. Type M1829-14M-36-39-02. P/N X7/6907 or 3M3B25. RARE!! Vintage Airliner Fatigue Meter Indicator. Type M1829-14M-36-39-02. P/N X7/6907 or 3M3B25. Very clean item. It shows very well and it would make an excellent show piece for the bookshelf in the office or home or just as a mock up panel item. Do you happen to know the type..